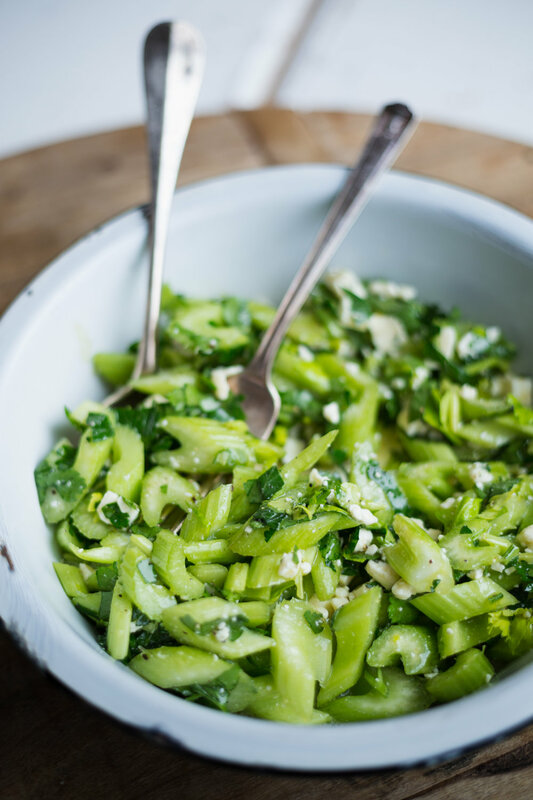 Quick, easy, and flavorful: this is my desire when making dinner these days. We have a very busy family life so every so often Mike and I find ourselves making an extra special dinner for an at-home date night! Babysitters seem to be scarce for us these days, but it’s so important to stop and relax and enjoy food we both love! Our littles go down for bed around 7:30, and then date night begins. Mike and I enjoy cooking together. Well, I cook and he brings the conversation! Nothing better than a glass of wine and your best friend. This spicy rack of lamb is truly special. The clever use of spicy, homemade buffalo-style sauce is absolutely delicious with the American lamb, and the crunchy celery & blue cheese salad cools it off just right! If you have kiddos and a full schedule but desire a special meal, you’ve got to try roasting a rack of American lamb. The meat is tender and mild, and your hot oven and simple marinade do all the heavy lifting. Fifteen minutes till dinner? I can get on board with that. 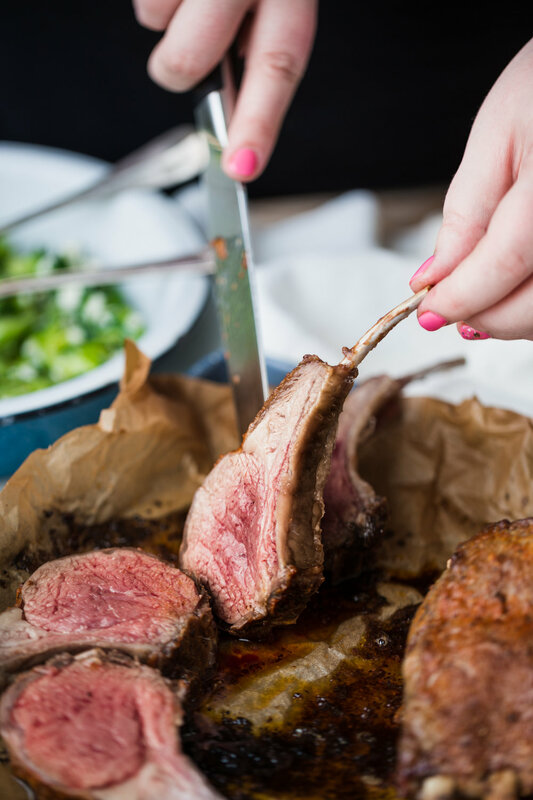 Don’t forget, it’s Lamb Lover’s Month, so pick up some beautiful American lamb next time you are at the grocery store, and give this recipe a go! And for all you romantics out there, hurry and enter the Lamb Lover’s Month “Date Night of Your Dreams” contest, going on now RIGHT HERE! Allow lamb chops to come to room temperature, roughly 1 hour on the counter. Preheat oven to 475°F. Line a baking sheet with foil or parchment. Season lamb on both sides with salt and pepper, and place on the baking sheet. Mix melted butter, garlic, pepper, parsley, and hot sauce. Spoon half the prepared buffalo sauce over the lamb chops and roast at 475° for 12-16 minutes*. For the final 2 minutes of cooking, switch your oven setting over to broil to crisp the top of the lamb. This will yield a medium rare lamb. Allow lamb to rest 5-10 minutes before slicing. While the lamb is resting, assemble the salad. *If chops are on the smaller side, roast 12 minutes plus 2 minutes under the broiler. Gently mix all ingredients. Best served immediately. Weeknight American lamb loin chops are quickly becoming one of my family’s favorite meals. When fresh and local, they taste like little ribeyes. On Friday I’m headed to Five Marys Farms in California for a girls glamping weekend with the American Lamb Board, and I can’t wait to share the experience with you when I get back! Heat a cast iron or non-stick heavy bottom skillet over medium to medium-high heat. Melt 2 Tbsp. butter in the pan and sear the lamb chops in 2 batches for 2 minutes per side. Add the herbs and garlic, lower the heat to medium, then baste the chops with herbs and garlic butter. Use a spoon to pour the juices over the chops while the pan is tilted away from you. Do not burn the butter or drippings. Remove the chops to rest and add the onions and apples to the pan, then sauté for 6-8 minutes until the apples are tender and translucent and the onions begin to caramelize. Serve the lamb with the apples and onions alongside a green salad or couscous.